1. Soak the vermicelli in boiling water for 15 minutes, or until tender. Drain, pat dry and cut into shorter lengths with scissors. 2. 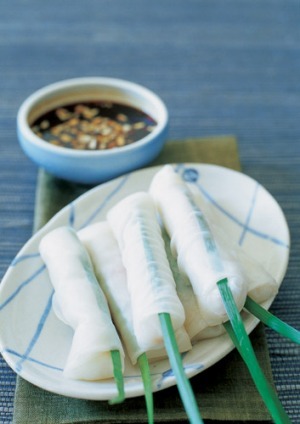 Dip one rice paper wrapper at a time into a bowl of lukewarm water and allow it to soak for 30 seconds, or until soft. 3. Place the wrappers onto a dry surface, spoon one heaped tablespoon of the noodles along the bottom third of each one, top with two mint leaves and two prawn halves. 4. Fold in the sides and roll up firmly, enclosing a garlic chive halfway through each one. Lay the rolls seam-side down on a plate and cover with a damp tea towel to prevent them from drying out. Serve with the dipping sauce. 5. To make the dipping sauce, mix the hoisin, soy and sweet chilli sauces in a bowl with the chilli. Top with the chopped peanuts.